[Pokemon GO!] how much exp is a pidgey? We've all done pidgey farming to boost our levels, it would be nice to know exactly how much exp you can get out of a pidgey. So here's a quick post calculating this number, and hopefully you find it useful. A pidgey provides 100 exp flat when you catch it, that's the base amount if we ignore good throws. 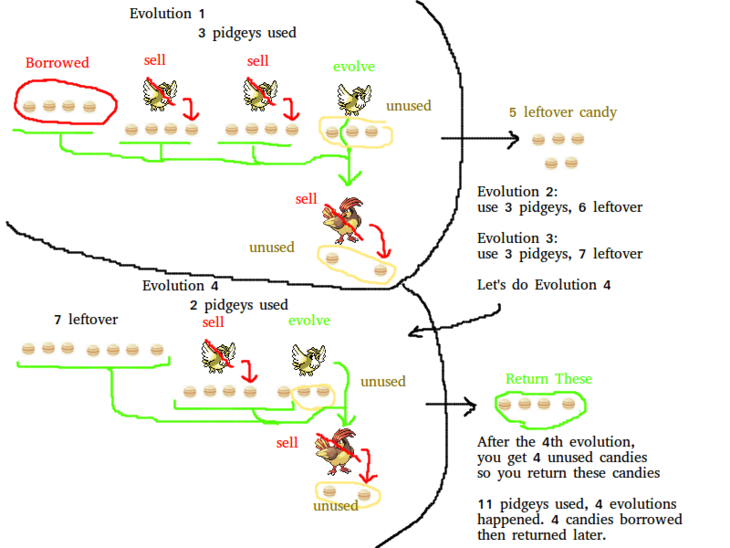 A pidgey contributes 4 candies to evolution (you sell it for 1 extra). An evolution of a pidgey costs 12 candies, but you get a bonus candy when you evolve it. Combined with the 100 base exp, we're looking at a very good amount of experience of 282 exp. If you use lucky egg with pidgey, you end up with 464 experience. Compare that with a ratata, which takes 25 candies to evolve. Each ratata would gain only 83 extra experience from evolving, and each ratata 183 exp. If you evolve ratatas with lucky eggs, you only get 266 experience. Compare 266 to the 464 exp gain of a pidgey, we see pidgey is far superior. The fact you can use the formula presented here is not entirely obvious, essentially it is only true when you catch a lot of pidgeys. Below is a link to a script I created, which would be helpful for you to see how many exp you can expect to get from catching a certain amount of pokemons (combined exp of catching and evolving, where evolving can be combined with lucky egg). Edit the caught list however you like, and hit run to get the results. How much exp is a magic carp? it gives you only 105 experience, that's a mere 5 more over the base rate. I suppose the garydos is worth it though. You just caught 11 pdigeys. You go up to me, and say "hey Evan, I got 11 pidgeys here that I want to evolve, but I need some help. I need to borrow 4 pidgey candies"
And to which I reply "Sure thing. Make sure to give them back though"
As you can see, as long as you borrow the candies and gave them back to me, you can pretend the cost of evolving your pidgeys is entirely dependent on the pidgeys you caught, and not dependent on the candies I lend you nor anything else. The candies are just there to start the process. Hope this helps! Happy farming. After level 20 it really makes no sense to try to grind XP. The amount of XP needed to level up is insane. Just play to have fun. Go for a run or a bike ride to hatch your eggs. Check what pokemon you can find when you visit a different part of town. i've seen the calculator yeah it just runs the simulation but it never theoretically solved for now much exp IS an actual pidgey, which is what I did here, with proof using fixed points. You should read my previous 2 blog posts on how to grind exp using pokestops, it is basically the end game. I'm lvl 22 right now and I think I can grind it all the way to lvl 30 using nothing but pokestops and lucky eggs. My town is suddenly full of assholes pointing their phones at nothong, would it be ok to kick them in their balls while they aren't paying attentipn? Btw: as i wad told i live in/on some kind of pokestop/shop, no idea, hate. GO is currently a good common grounds to meet strangers and get a convo. going. like school. you could just go up and ask what it's all about or why they're there, since you obviously don't play yourself. seems to me you're finding a random thread about pokemon GO to vent. that's cool, or you could let it burn down on its own if you really don't believe in it. Btw, can u go back to the kitchen and produce some quality conten... eeeh food?